To enquire about the Lazy Jack please use our contact us page. The Lazy Jack is a 4 berth trailer tent, one bed is situated over the trailer and accessed by a ladder that is provided. The second bedroom folds out from the awning and also comes complete with mattress. 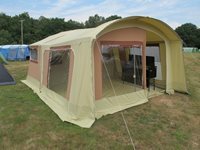 The Lazy Jack comes complete with an awning, the sides of which can be fully removed to make a sun canopy in hot weather. There is a large storage area in the trailer that can be accessed even when the cabin is erected and as with all models the tent can be completely removed to leave you with a trailer that can be used all year round. The Lazy Jack benefits from the Clima-C System which is a ventilation system to keep the living area at a comfortable temperature day and night and helps to combat condensation. There is also a range of optional extras to tailor the Lazy Jack to your needs. All Campooz models are equipped with the Clima-C System. The smart ventilation system ensures a comfortable temperature during the days and nights. All Campooz models are fitted to a high quality trailer. The tent can be easily removed and stored elsewhere, allowing you to use the trailer all year round. There is also an extended drawbaw available as an optional extra.